Doesn't it look like a big scoop of butter? A couple of weeks ago my friends Kajola and Terry came over to try two new ice creams I made: sweet corn ice cream and fresh mint ice cream. If you like corn, this ice cream is a definite must. Use the freshest corn you can find. The better the corn, the better the ice cream. This recipe is adapted from Claudia Flemings, The Last Course. 1. Place cream, whole milk and corn in a small saucepan. Bring to a rolling boil over medium-high heat, stirring occasionally. Once it has come to a boil, take it off the heat and let the corn infuse for 30 minutes. Blend with a hand mixer, blender or food processor. 2. In a small bowl, whisk the 1/4 cup + 2 Tbsp of sugar with the egg yolks until well mixed. Temper the egg yolk mixture with 1/2 cup of the hot cream mixture. 3. Once tempered, add the rest of the egg mixture into the cream mixture. Bring the mixture up to 85ºC or until it coats the back of a wooden spoon. 4. Strain the mixture through a fine sieve to remove the corn and cool. Let the mixture sit in the refrigerator over night or until completely cool, at least four hours. 5. Process in an ice cream maker according to the manufacturer’s directions. 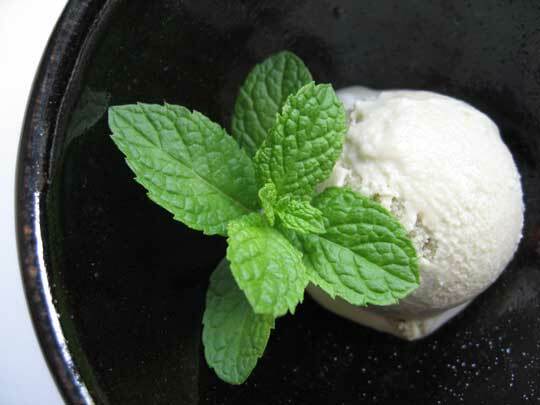 I find fresh mint in ice cream to be lovely and refreshing. It is definitely better than the common artificially flavoured and coloured mint ice cream. The mint in the recipe here is infused with milk and cream to create a wonderfully distinct flavour. There are many types of mint. I like using peppermint or spearmint, keeping in mind that peppermint has a stronger flavour than spearmint. Other mints might also taste delicious. 1. Place cream, whole milk and mint in a small saucepan. Bring to a rolling boil over medium-high heat, stirring occasionally. Once it has come to a boil, take it off the heat and let the mint infuse for 30 minutes. 4. Strain the mixture through a fine sieve to remove the mint and cool. Let the mixture sit in the refrigerator over night or until completely cool, at least four hours. Posted by Sam at 1:58 a.m. I'll try anything once....I even had roasted garlic ice cream once at the Gilroy Garlic Festival in California...it wasn't that bad. It does look like a big scoop of butter! Ice cream and corn ... yes I can do that! Thanks for the appetizing ice cream recipes, Sam. In my limited experience, I have found sweet corn ice cream to be delicious. When I saw F. today, he told me that a friend of his is a big fan of your blog. Yes, it's a small world. Lots of love. Hmm, sweet corn ice cream? Sounds interesting, I think I'd like to try some. That mint ice cream is what I'm really craving though! Sam...how creative! If I had my ice cream maker, I'd be all over the sweet corn recipe. For now, it'll have to go in the "recipes-I'll-make-when-I-have-all-my-kitchen-gadgets-back" file. I never thought of corn being an ice cream flabour. You have truly outdone yourself here. What creativity! I'll try anything once as well. Roasted garlic sounds interesting, hmm. 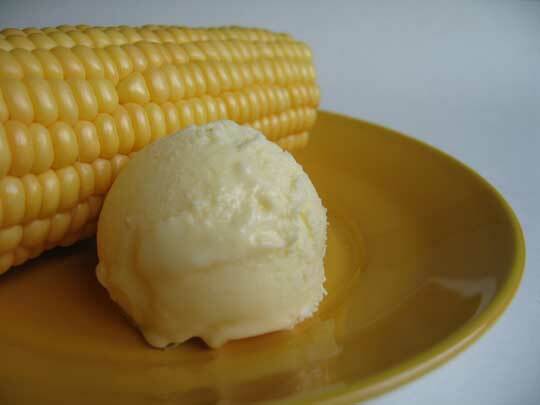 Sweet corn is one of those ice creams I would definitely try out on your new ice cream maker Ivonne. You won't regret it. I think you are more of an expert than you know. I'm happy that someone is enjoying my blog. It is definitely a small world. Thanks for your lovely comments Michael. Although I enjoyed the mint, the sweet corn rocked! Thanks! What would we do without kitchen gadgets? Thanks for your lovely comment. Have a wonderful summer! Though the recipe read 'sweeet and riiich' to me I had to try the corn one, with yummy results. Used one less egg yolk and sweetened it with no. 1 maple syrup. Wish I'd had a lower grade of syrup to use so that musky mapley flavour could come through more. Also, would use a darker corn next time instead of the pale peaches and cream variety and would try to find some free range eggs with really yellow yolks to boost the colour. I am eating it with blueberry sauce. Wow, what an idea. I found you searching for a mint ice cream recipe but feel like a just hit the jackpot to discover CORN ICE CREAM?! I love corn and everything made with it. Thanks for the great idea!